Volunteers are an integral part of the success of Feria Para Aprender and fill a number of different roles including greeting families, translating for organizations and distributing over 20,000 children’s books. 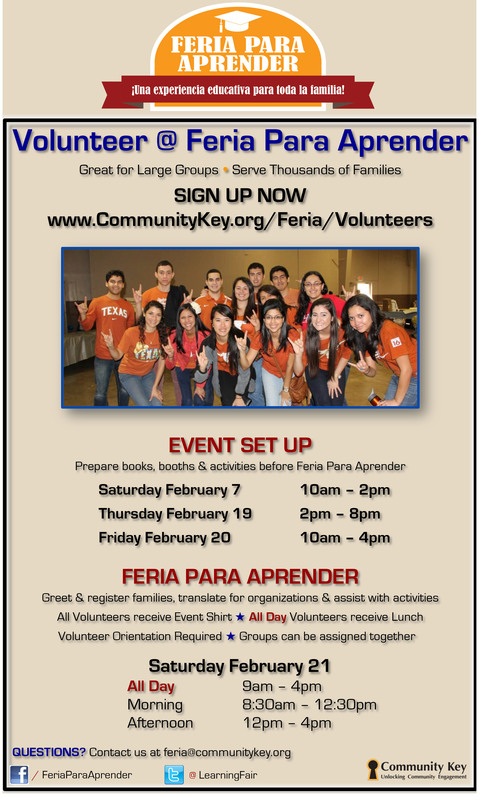 Feria Para Aprender is a great opportunity for student and professional groups to volunteer together! Volunteers who are fluent in Spanish are greatly appreciated but opportunities are available for volunteers who only speak English. To volunteer, please sign up for the opportunities below through GivePulse. If you don’t want to sign up with your Facebook account, you can also sign up with just your email address and create a private account. GivePulse is a great way to connect with volunteer opportunities throughout the year. * All opportunities will be held at Highland Mall located at 6001 Airport Blvd, 78752. Feria Para Aprender will provide over 20,000 children’s books to families. Volunteers will help organize books and other materials in preparation for the event. Minors may participate with adult supervision. Volunteers will help set up over 100 booths and activity areas in preparation for Feria Para Aprender. Wear comfortable clothes! 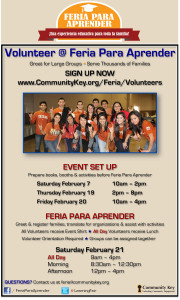 Over 200 volunteers are needed to ensure the safety and success of Feria Para Aprender! Include your student or professional group during registration to be placed in the same assignment. All Day Volunteers will receive lunch! If you have any questions about volunteering, please contact Christin Alvarado at christin@communitykey.org.